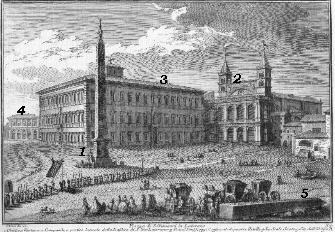 The plate shows the lateral square of S. Giovanni in Laterano (the main façade is shown in plate 46) . It was designed under Sixtus V who linked this site to Santa Maria Maggiore and the Colosseum through new straight streets. 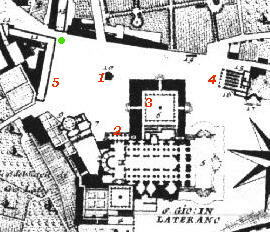 The plate shows also the obelisk before being re-erected by Sixtus V. The view is taken from the green dot in the 1748 map here below. 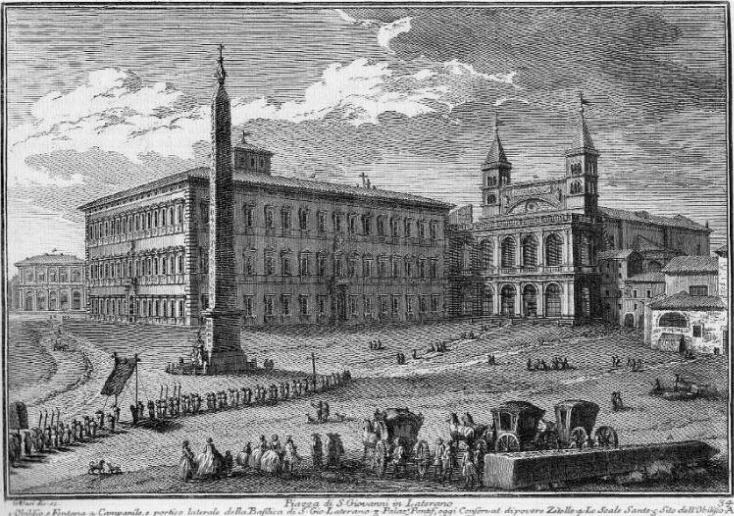 In the description below the plate Vasi made reference to: 1) Obelisco e fontana; 2) Campanile e portico laterale della Basilica di S. Giovanni in Laterano; 3) Palazzo Pontificio; 4) Scala Santa; 5) the site where the obelisk was found. If only the square was not a focal point of Rome's traffic, the view would almost exactly match Vasi's plate. The only change relates to the fountain which now is deprived of the statue one can see in the plate. 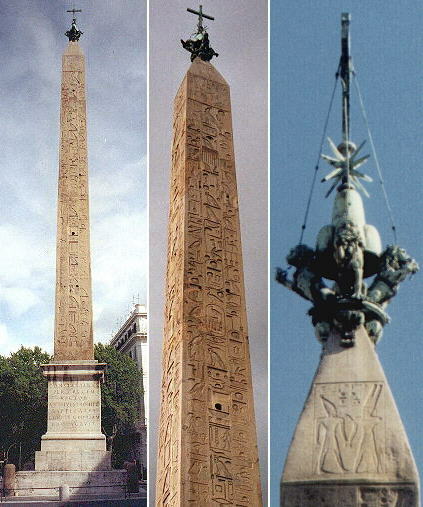 This is the tallest obelisk of Rome and also the last to be brought from Egypt (to see all the obelisks of Rome click here). Both Augustus and Constantine considered bringing it to Rome from Thebes, but only in 357 Constantius II was able to arrange the transportation by using a specially built ship. It was located in the Circus Maximus. It is also one of the best preserved, with easily readable hieroglyphics (for the happy few who can read them). On top of it Sixtus V wanted the whole array of his heraldic symbols: not only the three mountains with the star, but also the lion holding the pears. At first sight the fountain looks like many other fountains built by Paulus V Borghese, but at a closer look the dragons and the eagle have the appearance of having been "pasted" to the structure of the fountain. An inspection shows that originally the fountain was built under Sixtus V as the lion holding the pears indicates. A few years later Clemens VIII improved or restored the fountain and left his mark on the decoration on the top. Finally Paulus V added his eagle and dragons. This side of the Lateran Palace is a hymn to Sixtus V. His heraldic symbols are everywhere from the entrance to the roof, especially the somewhat astonishing association between the lion and the pears. This entrance to St. John was the most common because it was closer to the rest of the city. Just a few years before this plate the main façade was built under Benedictus XIV. This façade still retains some of its medieval structure. The two little tower bells bear the coats of arms of Pius IV, but they were built under Innocentius II in the XIIth century. The large loggia was used for the papal blessings (SIXTUS PP V AD BENEDICTIONES EXTRUXIT) and it was built in 1586 by Domenico Fontana. 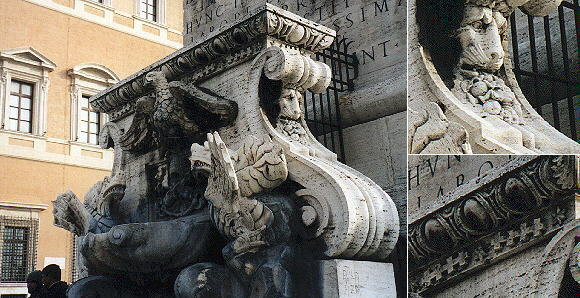 The symbols of Sixtus V cover most of the loggia. Clemens XII added the light railing with his elegant coat of arms. Domenico Fontana built this palace to host the staircase of Pilate's house, brought to Rome by St Helena, mother of Constantine. The 28 steps may be only ascended by worshippers on their knees. Here too the coats of arms of Sixtus V are everywhere. Read Charles Dickens's account of his visit to Scala Santa in 1845. Scala Santa Santa si dice questa Scala, perchè essendo stata del palazzo di Pilato, più volte vi salì il nostro Redentore in tempo della sua passione. 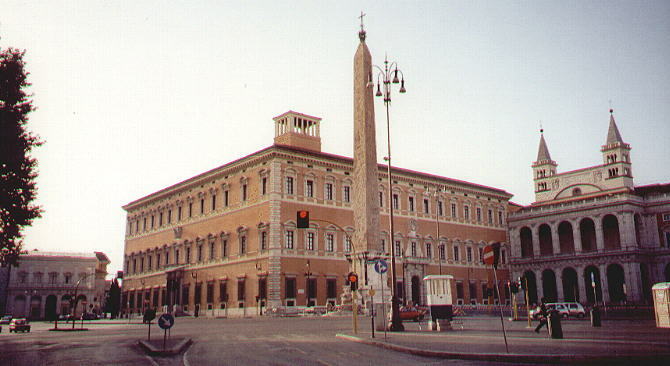 Quando fu portata a Roma, fu collocata presso la basilica Lateranense; ma poi da Sisto V. essendo in quel medesimo luogo edificato il palazzo Pontificio, eresse poco discosto un gran portico con cinque scale, ed in mezzo collocò la Santa, ad effetto che con devozione si salisse in ginocchio, e poi si scendesse dalle altre 4. laterali. Questa costa di 28. gradini di marmo greco, i quali per il continuo salire del popolo Cristiano, son tutti incavati, per lo che furono coperti di grosse tavole. In capo a questa collocò le reliquie dell'antichissima cappella segreta del Papa, detta Sancta Sanctorum coll'immagine del ss. Salvatore, nella quale non è lecito ad alcuno di entrare.